I'm convinced this is why they chose to tell their story in this special book. I don't think they mind the fact that their family is "on display." It's why the book is called Light from Lucas. This young man inspires people who observe him. His entire life - with all its challenges and struggles -- showcases I Corinthians 12:24-26 where we learn that, "God has combined the members of the body and has given greater honor to the parts that lacked it, so that there should be no division in the body, but that its parts should have equal concern for each other. If one part suffers, every part suffers with it; if one part is honored, every part rejoices with it." And I can't help but get a lump in my throat when I think that Lucas' dad decided his son's story was important enough to share. Share with people like me and you. No doubt about it. 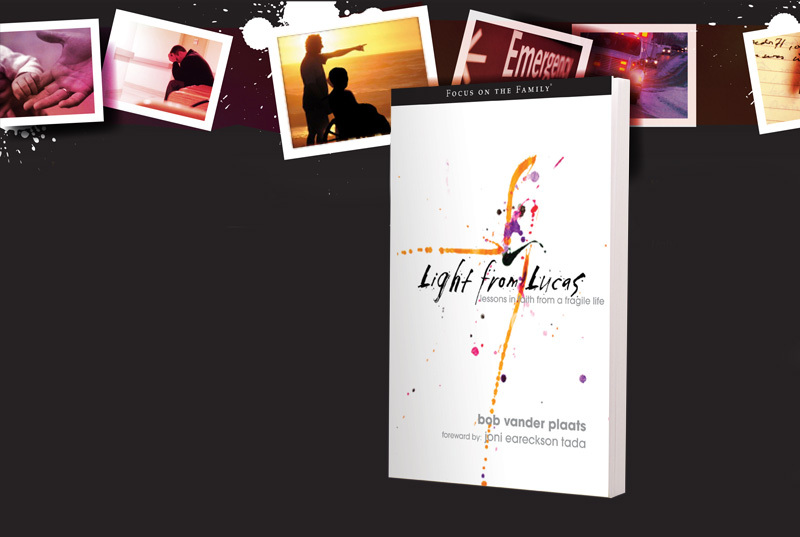 Your thinking will be illumined by the "light" shared in Light from Lucas. You will learn about a family whose hearts are settled and whose peace is profound. Don't worry, though - it's not sugar-coated; there are plenty of hard places with which you'll identify. The most important thing is, you just may end up deciding, If Lucas can make it, by the grace of God, overcome his limitations, I can, too. I've gotten used to being on display. Whether it's the child studying my wheelchair, the senior citizen across the way smiling sympathetically, or the waiter eyeing me carefully as I use my bent spoon to eat pieces of hamburger, I'm aware that people are watching. Some might watch out of pity, some out of admiration. All watch, I sense, with unspoken questions. It's part of the territory that comes with living in a wheelchair. It's what Lucas and his family face everyday. But like the Vander Plaats family, I choose to think that people's unspoken questions are, for the most part, good-natured. That's because the author of Lessons from Lucas and I, as followers of Jesus, are constrained to think the best of others. We are called to be on display (as any Christian is). We are encouraged by God's Word to smile from the inside-out as the strength of God shows up bountifully through our special challenges. When people eye Lucas in his wheelchair - when people see the smiles on the faces of Bob, Darla and their sons, I believe they are thinking, What an amazing family. How great their God must be to inspire such faith and confidence.